A new dining table calls for new dining chairs. It’s a law or something, right? That’s what I told Handy Husband. I wanted something completely different from what I’ve been sitting on for the past 15 years. FIFTEEN! It seemed like a good time to mix things up. 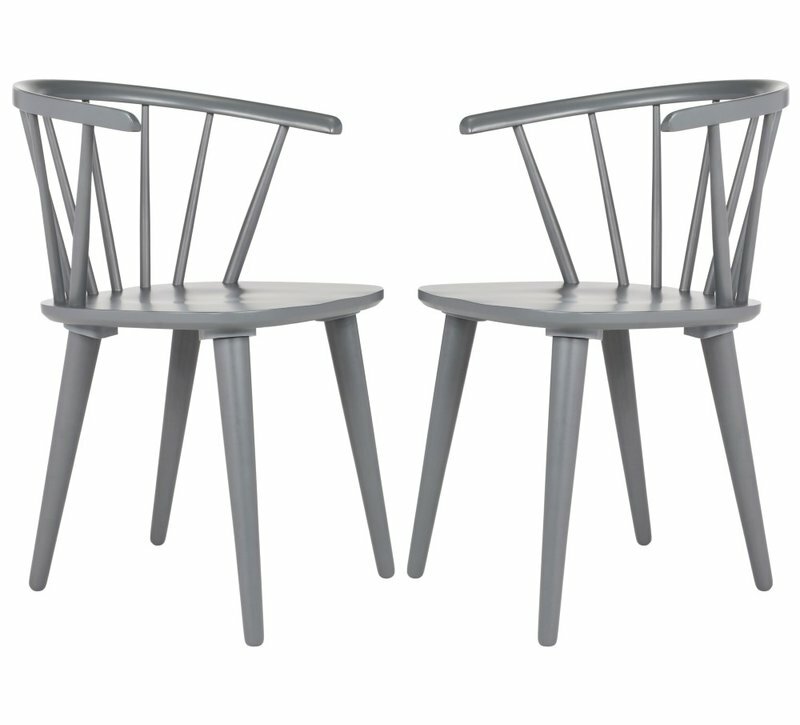 I really wanted these chairs, but they wouldn’t push under my new table and space is at a premium in my dining nook. Instead, I found a similar style with a higher back. It’s the TMS Angelo Home Hermosa Dining Chair from Wayfair. I loved the blue color, but not the yellow. At least, not for my space. I bought the chairs knowing I’d want to make them over straight away. Except, as I am known to do, I needed to overthink about the makeover for awhile. I had just come off a challenging painting project and my confidence was rattled! Did I want to spray paint the chairs and what color would I use? Did I want to cover over that yellow part in a more permanent way? I wasn’t sure. While wandering Michael’s looking for inspiration (anyone else do that? ), I stumbled upon some fabric tape. I didn’t know fabric tape was a thing. Clearly, I need to wander the aisles of craft stores more often. Handy Husband is probably saying, “No, you don’t need to do that.” Ha! 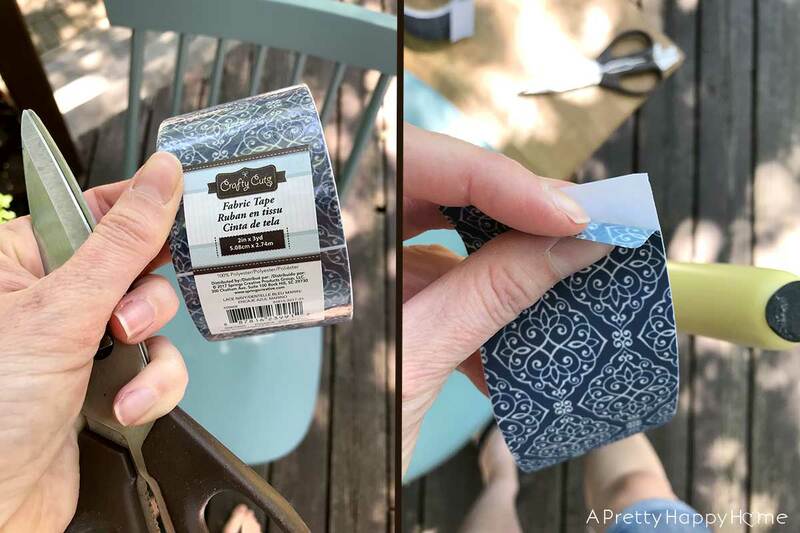 I decided I liked the print and color of this fabric tape and it might work as an interim makeover solution. Plus, I just wanted to try the tape out. Curiosity is a powerful motivator! There’s no tutorial here, folks. It’s cut a strip of tape to size and wrap it around the chair legs. I started off trying to line up the pattern, but quickly realized I’m not a perfectionist you couldn’t really tell either way. The tape has a backing, so it’s not like duct tape or some other tape that sticks to itself. Just peel off the backing and position the tape. It was also easy to reposition the tape, which I had to do multiple times. Wrapping a tapered leg is not easy. It took two rolls of tape to cover the yellow paint on my four chairs. Total investment (because I always use a coupon at Michael’s) was $5.98 and an hour of time. I have been surprised with how durable the tape appears to be over the course of this first month in use. In full disclosure, it’s not a perfect solution. There were 3 or 4 pieces of tape that started to peel up in the first few days after the makeover that I secured with hot glue. I haven’t needed to do any other “touch-ups” so far. For that reason though, I’m calling this a temporary fix and not a longterm solution. I don’t think we are in 15-year territory here, folks. The stakes were really low with this experiment, so this was a good way for me to satisfy my curiosity and to stretch myself creatively. Besides, how often do you see printed patterns on wood dining chairs? Not often! I’m happy I went out on a limb to see what would happen. The only unanswered question is have I decided my long-term chair makeover plans? Of course not! I need to overthink it some more. P.S. 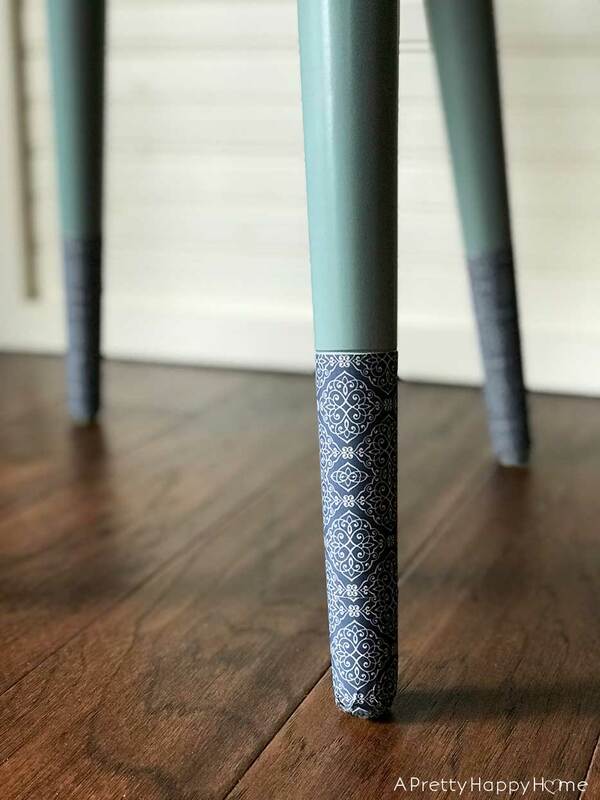 A few notes about this fabric tape and how I used it on the chairs. 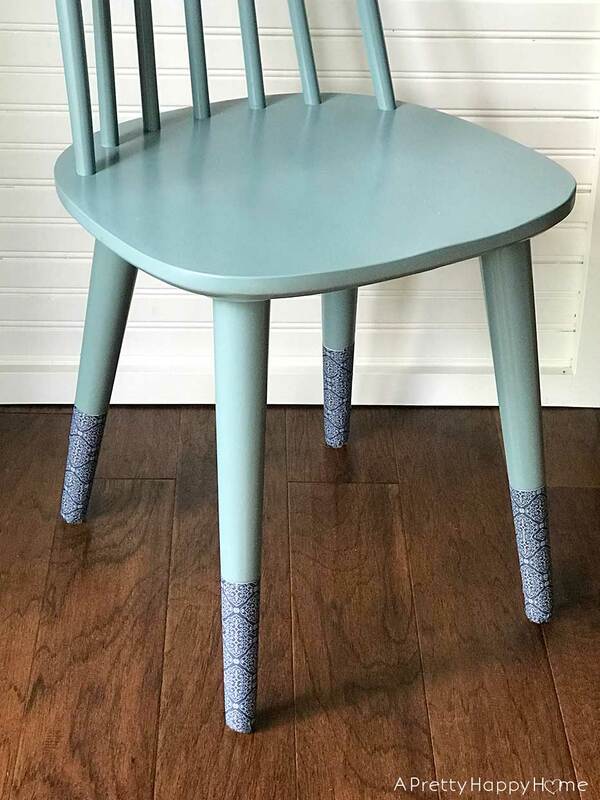 I don’t know how the fabric tape would hold up if you have pets that are hard on furniture in terms of scratching or constantly rubbing against the chair legs. Not only are my chair legs tapered, they are rounded at the bottom. I made several small snips in the last piece of tape closest to the end of the chair leg. 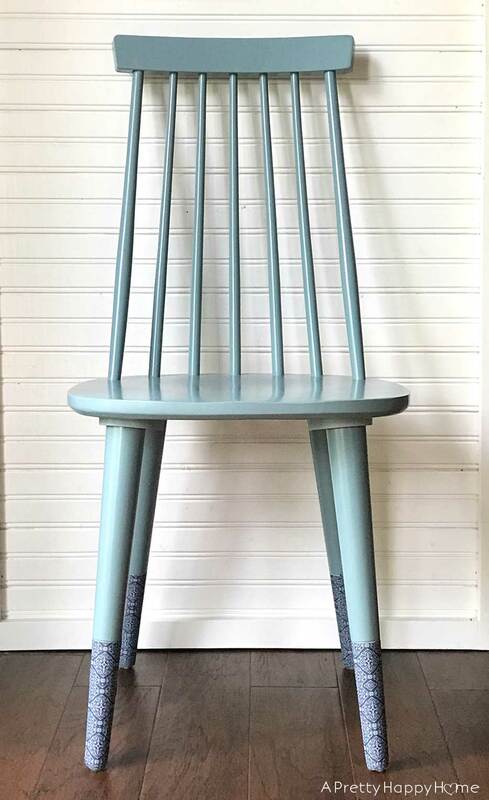 That way, I could push each little strip of tape down and the strips would lie on top of each other more nicely to finish off the bottom of the chair leg. I had a hard time finding fabric tape online other than at Michael’s. P.P.S. 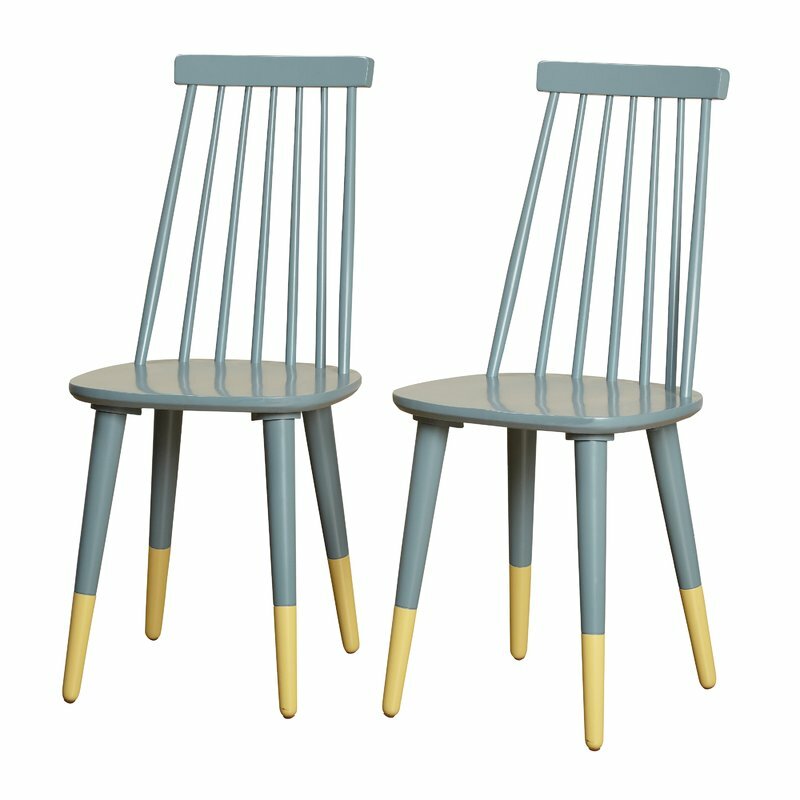 A few notes about the chairs from Wayfair. The quality seems fine for a chair that ships to you and you have to screw the legs in yourself. I have had to tighten the legs a couple of times. Don’t sit on them with any sort of metal rivets on your pants. They will scratch. I found that out the hard way. Until I find some touchup paint, I used one of my kids’ markers to color in the scratches. Totally worked! The biggest issue I have in relation to the chairs is with OUR flooring. We have ceramic tile floors, so there is some unevenness between the tile and grout. The self-adhesive floor pad keeps slipping off as the chair gets moved around on these uneven surfaces. 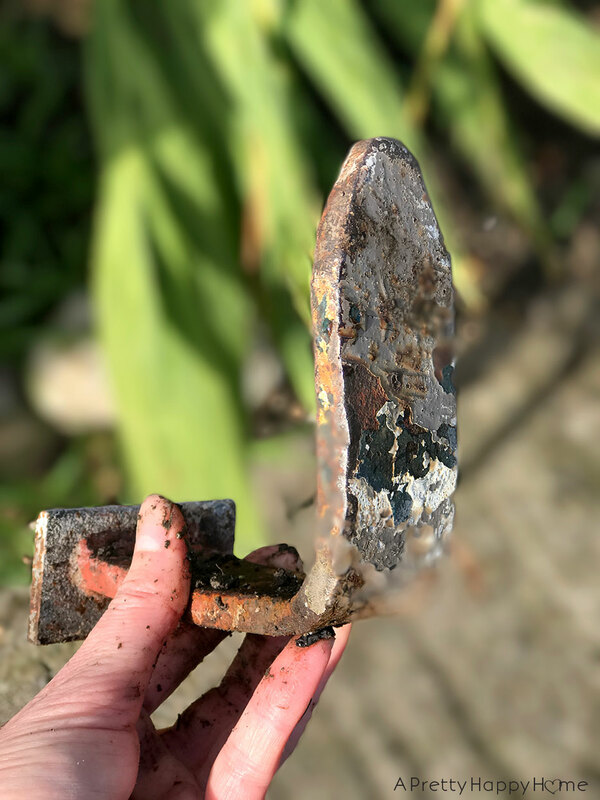 This happened when I used the factory floor pads and when I used my own from Home Depot. So far, I’ve had the best luck with hot glueing a piece of felt to the end of each chair leg. If you have wood floors or a rug under your table I doubt this will be an issue. If you want to know more about my old dining room table and chairs, here are some posts for you! Oh, and a few more good ones!